Eclipse Day - Kennesaw, Georgia to Rockledge, Florida - - PAGE 424. 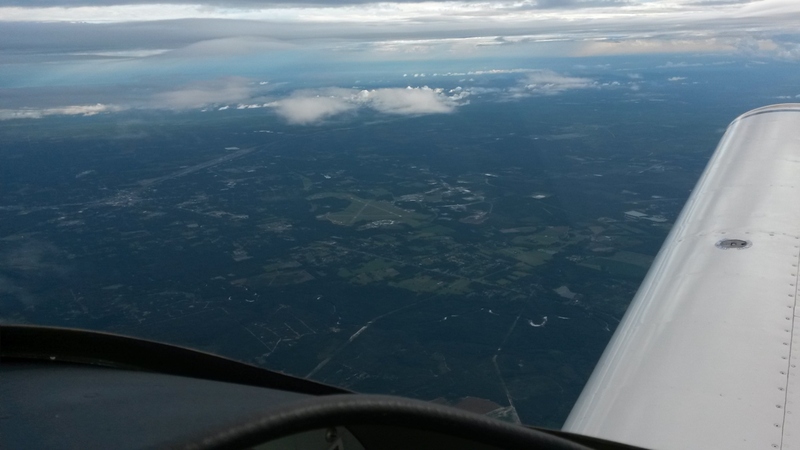 Eclipse Day - Kennesaw, Georgia to Rockledge, Florida · · PAGE 424. August 21, 2017: Marshall made a pair of videos on approach to landing at KRYY, McCollum Field at Kennesaw, Georgia. I have not had a chance to process them yet and hope to have them soon. I was having an intermittent problem with the alternator field current and battery charging as I approached this airport. We unloaded Marshall's stuff and I was able to get the airplane into a hangar to check things out. I finished the checkout and ran the engine before putting the cowl back together. A quick check of my fuel aboard and my GPS flight plan and I was off again heading back to Florida. 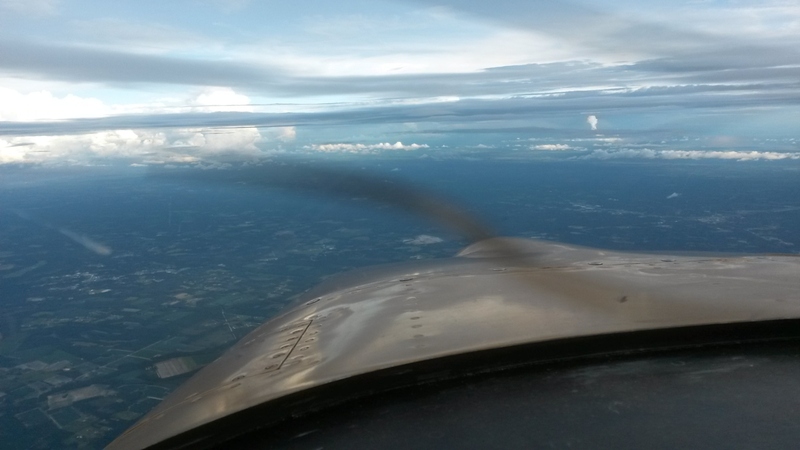 A few minutes after my takeoff from McCollum airport, the control tower gave me a warning about an aircraft ahead and above me as I departed to the East to stay away from the Atlanta Class B airspace. 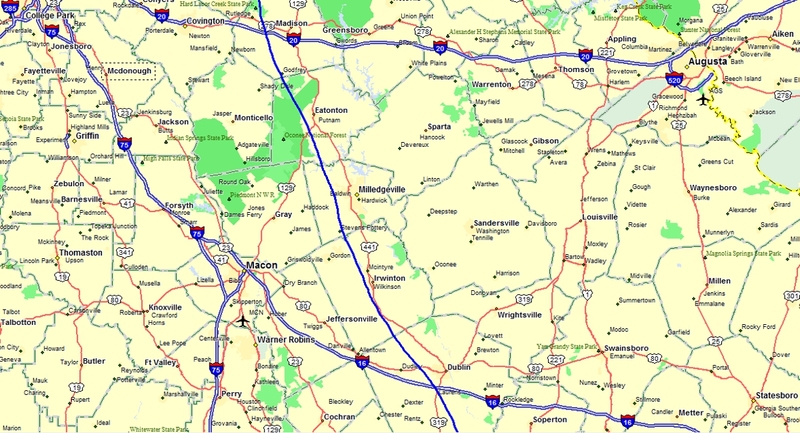 I turned south over near Dacula, Georgia and flew my usual north -south route toward Milledgeville, Dublin, Hazlehurst and the Jacksonville area. 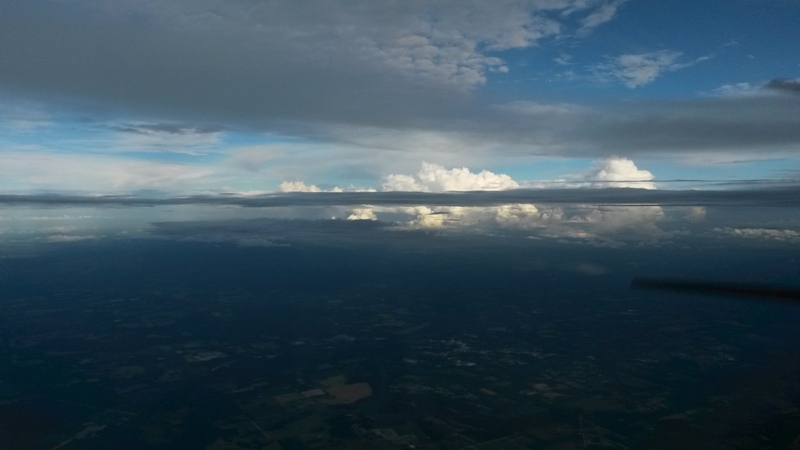 When I reached the Milledgeville area I could see a thunderstorm with cloud tops well above my 9,500 feet cruising altitude. I wisely went around the WEST side as there was a wind blowing FROM the west. I did not get a photo, but I was able to put my GPS ground track on a map of that area seen below. 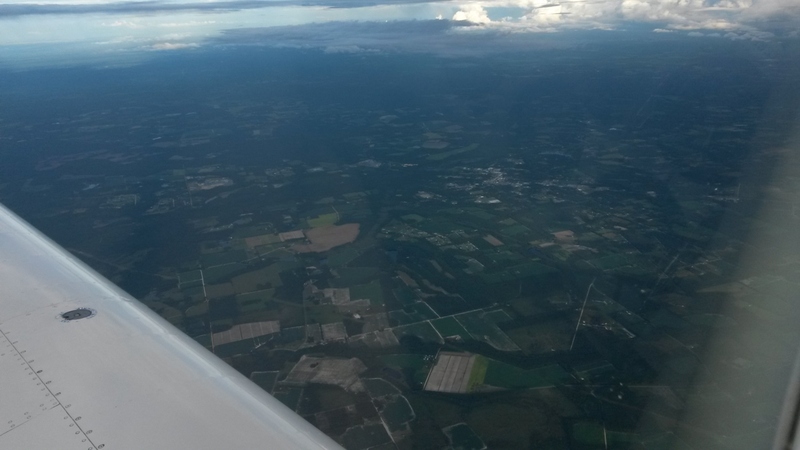 I had good visibility up high and could see where I needed to deviate about 50 miles before I got there. The result in the trace below is no sharp turns. I had enough fuel aboard and I did not stop at Hazlehurst on the way home. I did not find the camera bag as I was flying and ended up using my cell phone to take pictures when I got to the Waycross area where I took this picture and all that follow. The time stamp on this photo is 6:35:25 PM. The prop shape is exaggerated by the scanning rate of the image sensor. I got out my yellow telescope and confirmed I could remain in VFR conditions ahead in North Florida. This shot is looking left of the image above, but you can see one blade of my propeller on the right side of the picture. I am thinking whether to EAST possible over he ocean or WEST around those high cumulus clouds ahead. All those clouds are the Jacksonville, Florida area. I took this shot to see what weather could be coming in from the West. I zoomed the image a bit. Here is another photo looking West with a non-zoom setting. This shot is looking down on the left side of my flight path. All these images were taken in just over one minute near Waycross, Georgia. 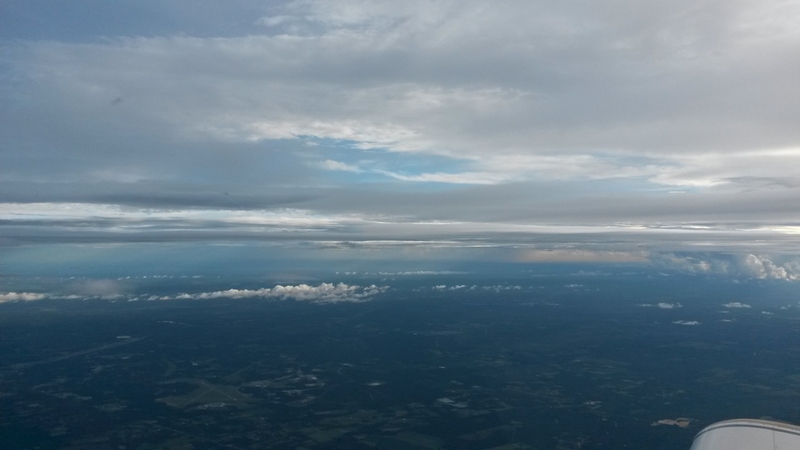 I have been descending to line up for clear air in between those cloud layers ahead. This last image was snapped at 6:43:08 PM south of Waycross. That is US 1 down there heading toward Folkston, Georgia and the Florida state line. I see my VFR path ahead and I will be WEST of those clouds ahead, to the right from this vantage point. My path took me over the Saint John's river near Green Cove Springs when I turned southeast to follow Interstate 95 back home. I learned to fly in weather like this as a student pilot. 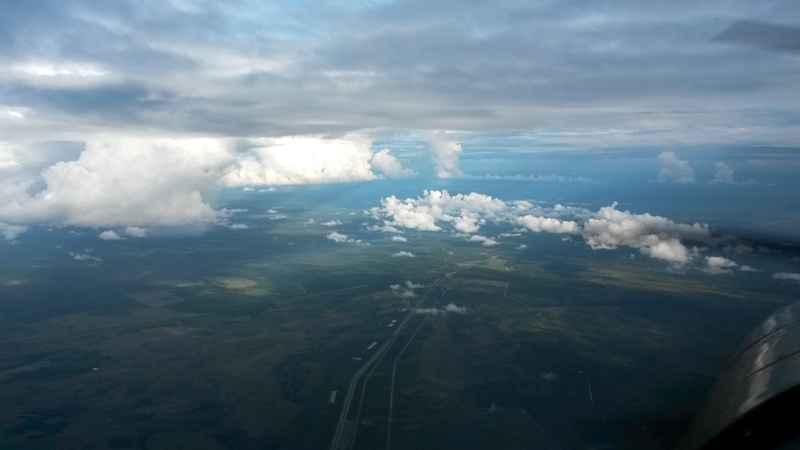 If you do not like the weather in Florida, fly around it. Here is the map of my Jacksonville passage southbound on August 21, 2017 heading home. The path around the clouds and light rain is clearly shown on the west side of Jacksonville. This is my path to get closer to the beach to miss inland thunderstorms as I get closer to home. I was listening to Daytona Beach Approach Class C controllers and could hear them working a few pilots working on practice approaches in less than perfect weather down low. 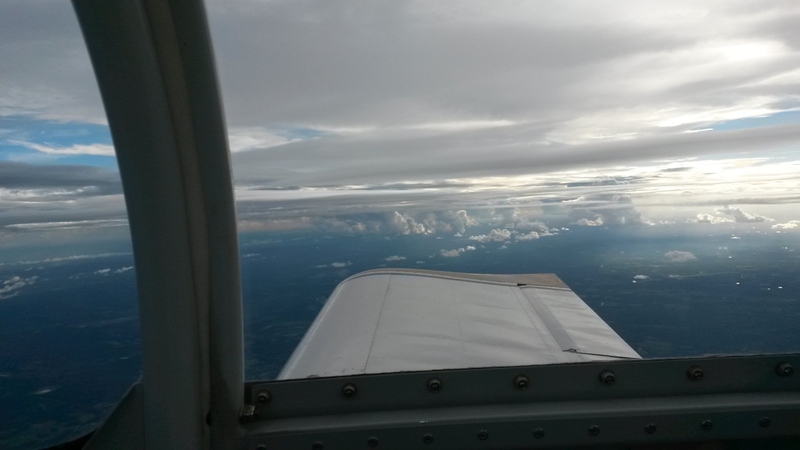 I stayed up at 7,500 feet and remained clear of all clouds in VFR conditions. 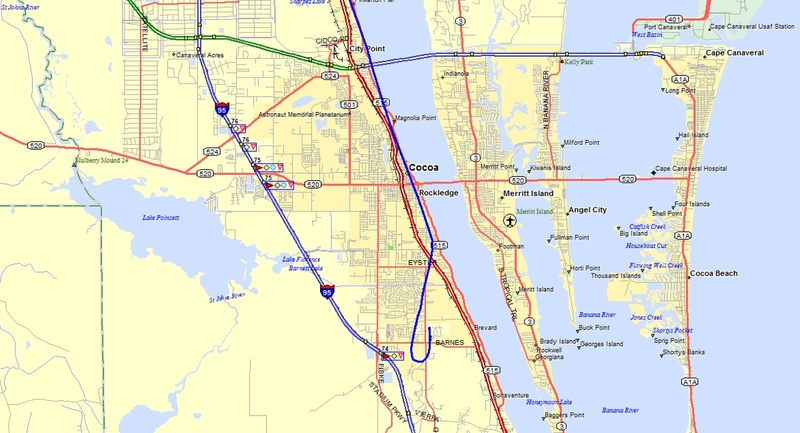 I flew over Titusville Airport at 7:56 PM doing 185 MPH to get on the ground at Rockledge at 8:04 PM, just after official sunset at 7:55 PM according to my GPS almanac on that day. Here is the approach and landing back at Rockledge Airport. The only other "Sunset Landing" I have ever made was my return to Folks Field from my Denver Trip in June 2006. 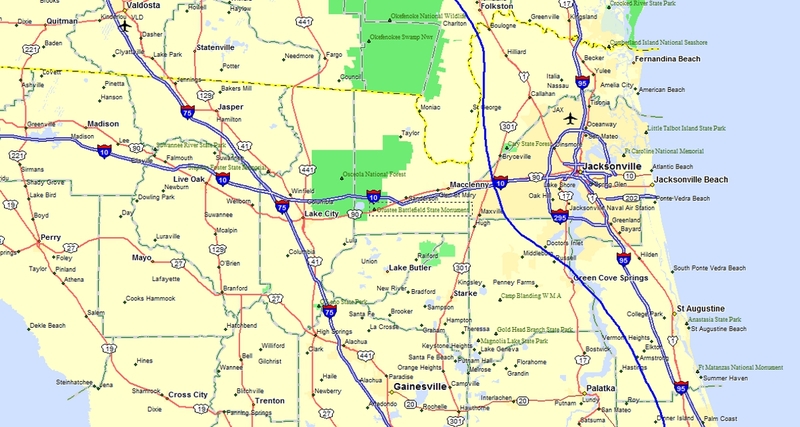 The Titusville Airport is about 18 miles north of the Rockledge Airport. FAA regulations state that twilight is defined as 30 minutes before sunrise and 30 minutes after sunset. Since there are no runway lights at Rockledge, I was making sure I could get there close to official sunset. Visibility on the approach and landing was not a problem. August 22, 2017: When I landed last night, I opened the hangar door with the lights inside used to help me unload all my stuff from the airplane. I could not put the airplane in the hangar last night and what you see here is where I left the airplane outside over night, all locked up with the brakes set. A gyro copter is parked front and center in the hangar and my long wingspan prevents me from getting in or out when it is parked inside. I learned the right way to move it if this should happen again. Billy went home at 5 PM long before I arrived. August 23, 2017: My old Caddy took me up to the Merritt Island Airport to buy 10 gallons of 100 Low-Lead AVGAS to put in my airplane. I did not have enough fuel in my airplane to think about flying up there. I cleaned the bugs off the airplane and started thinking about doing a repair on my Navaid autopilot. 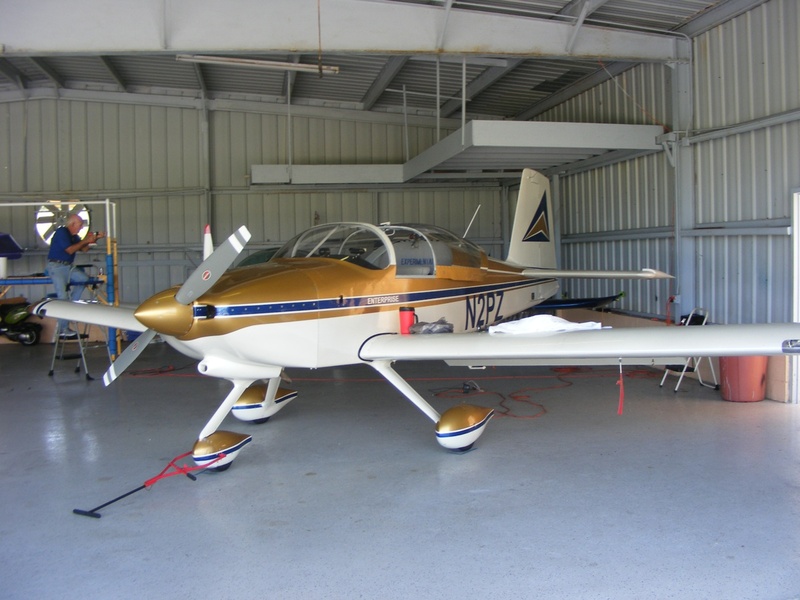 I was expecting to take a short test flight after adding the 10 gallons of avgas. I pulled the airplane out on the ramp and tried to start the engine. The prop moved to the first cylinder compression point and stopped. The battery was dead. August 25, 2017: I got in touch with Jim Ham in California. He designed the GPS Smart Coupler to interface with the Navaid AP-1. He had the schematic for the AP-1 and sent it to me in a pristine PDF file, not a scanned document. Now that I have the schematic, I will be removing my Navaid Device AP-1 from the airplane to work on it here at home over the Labor Day weekend that is coming up. You can see Bill in the background working on a moving scaffold used to work on the rotor head of the gyrocopter. I will take a photo of it the next time I go to the airport. I am publishing these Eclipse pages on Wednesday evening, August 30, 2017 with updates and corrections on August 31, 2017. The total time added to the Hobbs meter for the Eclipse trip to Tennessee is 10.8 hours with two fuel stops along the way, The current Hobbs meter reading is 405.3 hours for my RV-9A "ENTERPRISE". 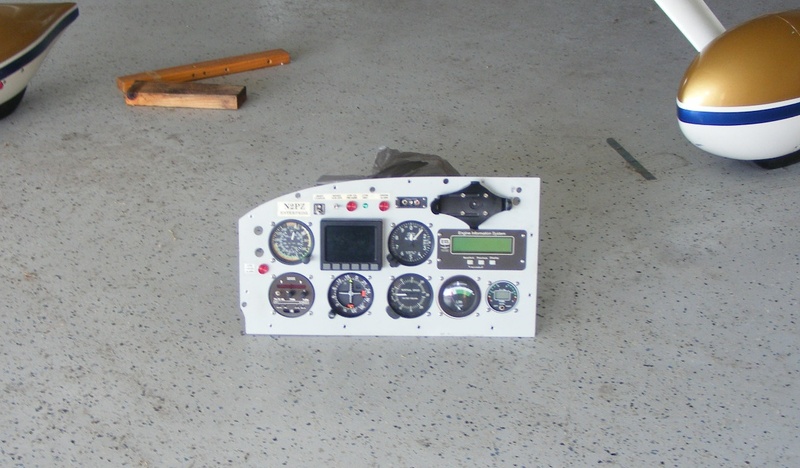 September 1, 2017: I went to the airport to remove the instrument panel and discovered one less airplane in the hangar. My airplane is back in the southeast corner of the hangar. 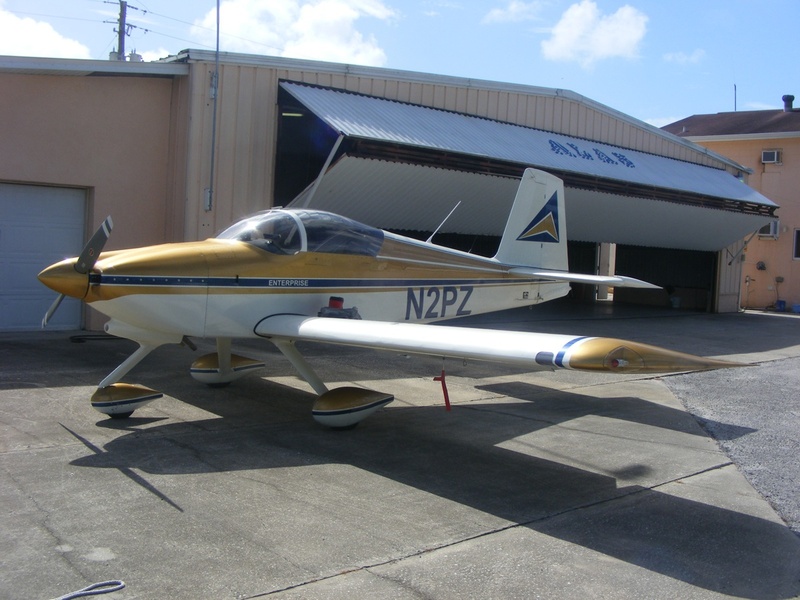 One of the two light sport Faeta airplanes went to Virginia for sales purposes. I pulled my instrument panel from the airplane and brought it home to work on the Navaid AP-1 control head now that I have the schematic with reference voltages. The test on the kitchen table with a 12-volt DC power supply showed normal operation as I moved it and twisted it while watching the LED bar graph on the face. I used the schematic with its test point voltage readings to probe the circuit boards while I had the cover off the unit and the 5.3 volts was still correct. The LM317T is the voltage regulator to create that reference voltage. There is one pin on the back of the unit not used in flight, but it did have the voltage test point that shows the balanced voltage level when the unit is engaged with wings level. 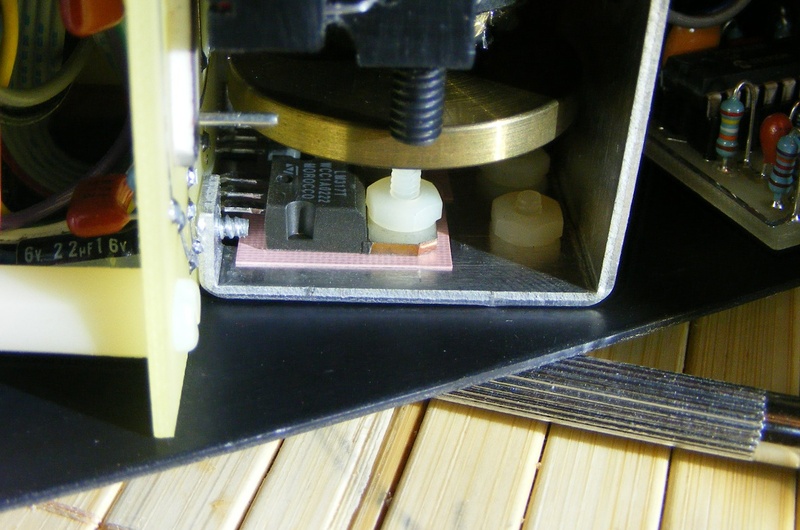 That brass wheel in this image below is one of two wheels on opposite ends of the gyro motor. Yes, this is old school technology compared to the modern Dynon sensors, but it still works. Having tested this unit from a 12.5-volt DC power supply, I feel that my failing battery was causing this unit not to work in the airplane. Low voltage into this unit appears to be at the heart of my "autopilot problems". I will know when I get a new PC680 battery installed and do a test flight to follow a GPS course with the autopilot engaged. The Navaid unit is back in the panel and ready to return to the airport tomorrow (Saturday). 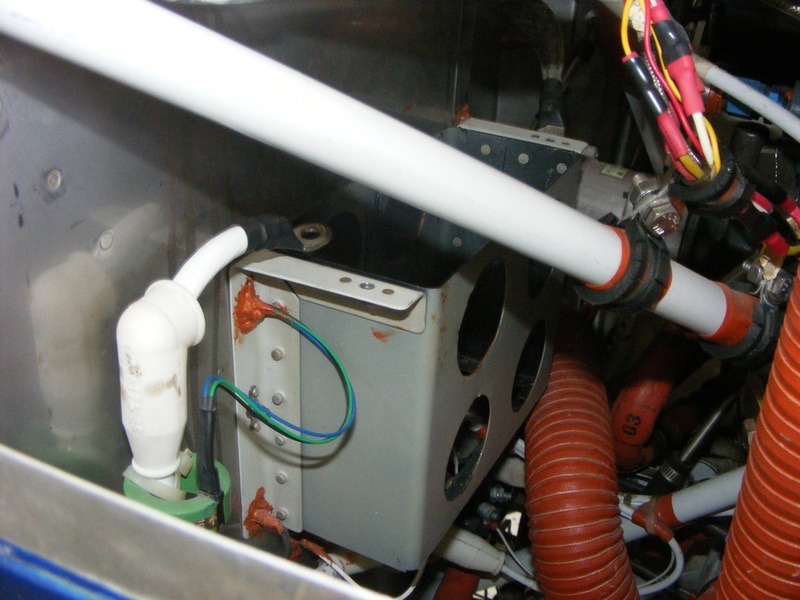 The connections that must be made when installing the panel are two DBM-25 connectors, male and female to the back of the Engine Information System monitor, one multi-pin connector with a rotary collar to lock the connector to the electronic fuel gauge, one large snap-on connector for the GI-106 VOR resolver below the Dynon unit, the multi-pin connector on the Dynon unit, a telephone cable that snaps on the back of the ELT test panel just to the left of the GPS mount, a 12-pin Molex connector on the back of the Navaid wing leveler, two air connections to the Lift Reserve Indicator (LRI), and the pitot and static air connections to the air speed indicators to the left of the Dynon unit. A tee connector on the pitot connection of the altimeter also feeds the pitot input port of the Dynon unit. 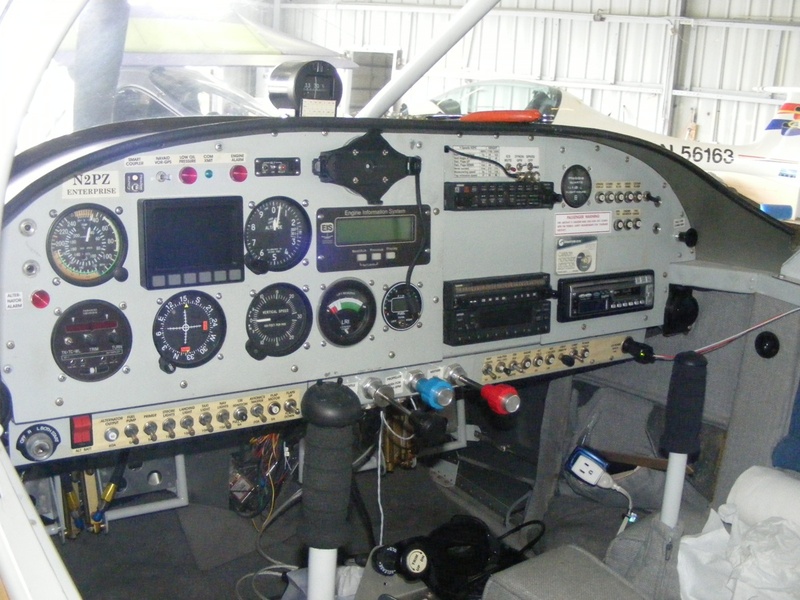 The static air port of the air speed indicator also has tubing running to the Dynon unit and continues to the altimeter and vertical speed indicator. There is another 12-pin Molex connector for other connections on the instrument panel for the engine alarm, low oil pressure and alternator alarm lights. 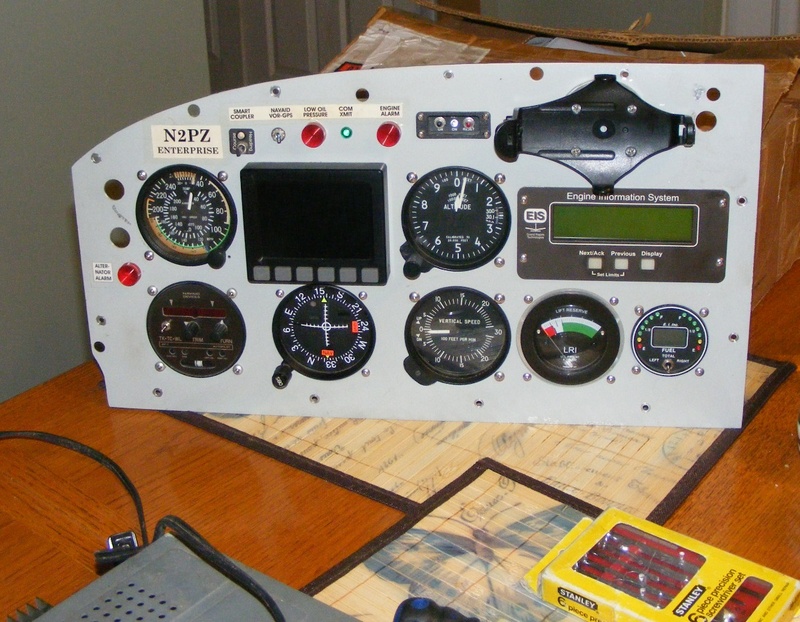 The GPS serial data for the Dynon and the Navaid device is also in this second Molex connection to the instrument panel. There is one other thing to mention about the airplane. During my postings about the Eclipse trip, I mentioned reflections from inside the canopy affecting some of the photos I have been taking behind the left wing in flight. I remembered to buy a BLACK bath towel when I was getting groceries today. It is large enough to cover the cargo area behind my seats. I have put the towel in the back seat of the Caddy and will place it over the cargo area on my next flight. 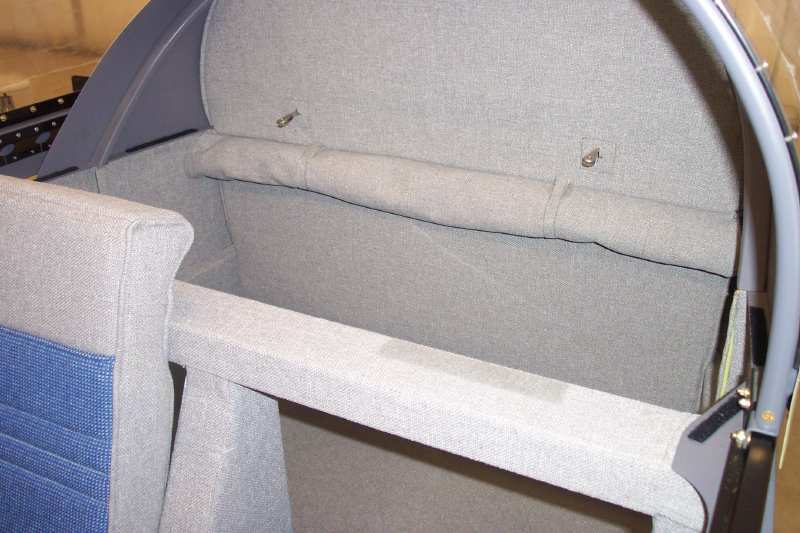 I will have to unroll the cargo cover from the back wall to support the black towel, and also have to put the towel over the shoulder straps and cables not seen in this photo from my Flight Line interiors page. We will see how the photos turn out. 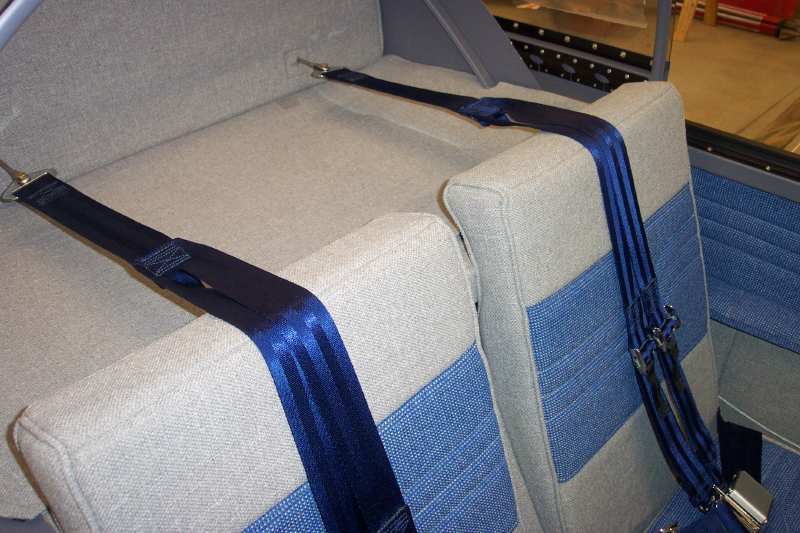 The black towel would lay over the straps and cover extended as seen here in one of the photos from Flightline Interiors from this page of my web site. September 2, 2017: Back to the airport on Saturday to get the instrument panel put back and ready for flight. I also checked the battery when I found the GREEN light illuminated on my battery minder/charger. I removed the top cowl and checked the battery voltage directly at the battery terminals. My digital voltmeter read more than 13 volts DC. I then went into the cockpit, turned on the avionics master switch, turned off the radar transponder, leaving the engine monitor, electronic fuel gauge, and the Dynon D10A as the only items operating. The Dynon unit has an internal battery and it was working normally. The avionics power bus is monitored on the Dynon screen and it showed about 10 volts DC. This voltage was confirmed at the battery terminals indicating there is one dead cell in the Odyssey PC680 battery. 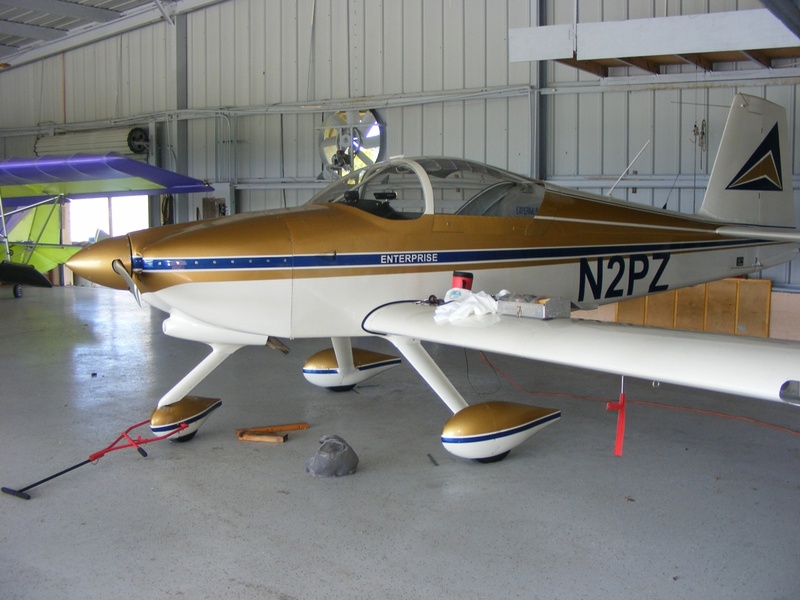 I have been flying this airplane since June 2005 using three PC680 batteries over those 12 years with an average battery life of four years each. A new battery gets ordered this week and hopefully will be here before next weekend. I know I said I would take a photo of the gyrocopter when I came to the airport again. Look through the windshield to the left of my wet compass above and you will see the doors are off the copter. Since my airplane is in the SE corner of the hangar, there is an Aventura II amphibian parked in front of my airplane and its right wing is partially blocking the view of the gyrocopter. Maybe next time when I go to the airport to replace the failed PC680 battery. Here is the page from the last time I replaced the battery in 2014. This is the Labor Day weekend here in the USA with the actual holiday coming tomorrow, September 4, 2017. Today is Sunday and my usual day to update this web site. September 4, 2017: This is the Labor Day holiday here in the USA and many things are closed and the US mail is not delivered today. I have been spending the day working on this web site to update the older pages of the web site by upgrading the photos to 1200 x 900 resolution images. I have finished updating pages 1 through 19 about building the airplane. This project could take a month or more to update all those pages. It appears I did not start using 1200 x 900 resolution photos until I got to page 406. I just discovered an error on page 406 that I will fix now. The replacement PC680 battery is ordered and could be here before next weekend. Hurricane Irma could be an issue in Florida by next week depending on the path it takes. We shall see as all the weather forecasts are focused on this major storm out in the Atlantic Ocean. September 16, 2017: The Odyssey PC680 battery arrived yesterday and was installed today. 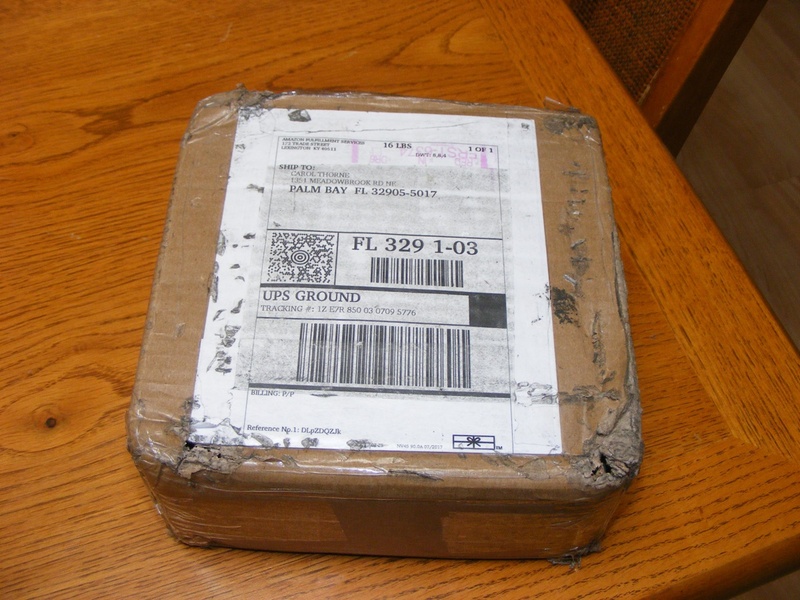 It traveled from California to Florida via UPS Ground on a train to Jacksonville, Florida. There was a delivery delay in Jacksonville due to flooding of the Saint Johns River from the heavy rains in Florida from the path of Hurricane Irma this past week. The river flows north from here in Brevard County all the way up to Jacksonville before it turns EAST to end at the Atlantic Ocean near Mayport. 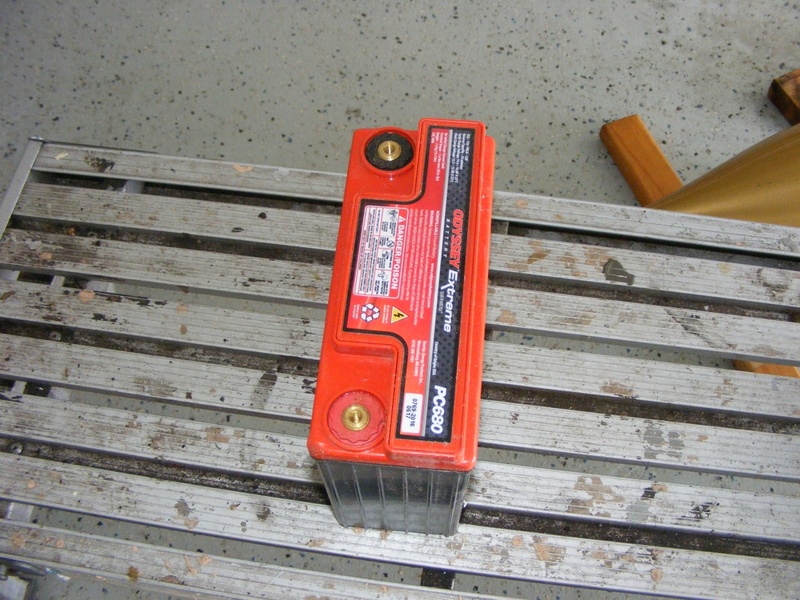 The old battery was removed from the battery box mounted on the firewall. Here is the new battery ready to be installed. When everything was connected and the initial voltage tests were made, the trickle charger was connected and the red light came on as the 2-ampere charging mode always runs until the battery is fully charged.